A woman with chronic fatigue syndrome has accused Manchester Airport of treating her like "cargo" and "cattle" following a long-haul flight. 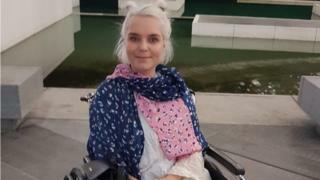 But she found the experience "distressing" and "humiliating" after being asked to walk to collect her own wheelchair. But when the plane landed, she was told there was no staff member available to provide the service and asked to "walk around the corner to get a wheelchair". She said: "I was nearly passing out. There wasn't anyone there and I started feeling numb. "Obviously people can't see it [my condition]. I'm in my 20s and people probably think I'm fine. It felt like we weren't considered as people - it was definitely as cargo." She said she was told understaffing was to blame, while a total of 20 people on her flight needed assistance. Ms Stafford added: "It made me very aware of my vulnerabilities and also aware of how dependant I was. I felt like I was a chore." Chronic fatigue syndrome, which is a long-term illness also known as ME, has a range of symptoms including extreme tiredness, dizziness and muscle and joint pain. After activities such as cooking or walking a short distance, Ms Stafford needs to rest for 45 minutes. Chris Wood, of the disability campaign group Fly Disabled, said the current system is "broken", adding: "All airports are trying to address this and some do it better than others". In July 2018, the Civil Aviation Authority (CAA) rated Manchester Airport the worst in the UK for helping passengers with disabilities after the hub failed to meet its targets to ensure people leave in a timely manner from inbound flights. Fiona Wright, customer services director at Manchester Airport, said Ms Stafford's case was under investigation but insisted improvements has been made since the CAA's criticisms. A new provider is set to take over the service on Monday.